Indoor sport centers come in various sizes and can have a wide range of features. The purpose, however, is the same in all. They exist to help maintain fitness and generally improve our well-being. While these purposes are facilitated by treadmills, basketball courts and buff trainers, LED lighting can be there to provide a helping hand. Maintaining our health is a complex business. We can spend a lot of money on new gym equipment, expensive nutrient drinks or whatever the current health fad suggests. However, if we don’t respect the fundamentals we can end up doing more damage than we think. Light is one of these fundamentals. Our bodies need light to maintain various processes when it comes to metabolism and brain function. We can become depressed without the vitamin D light provides (which is why it needs supplemented in countries with less light). However, our basic daily rhythms, when combined known as our circadian rhythm, is affected when we don’t get enough of it. Sports centers and gymnasiums may facilitate exercise, but if they do it in an environment where the light is not conducive to physical exercise, the result is being counterprodutive. If it is too low, too weak or of the wrong kind, then it can disturb our equilibrium. LED lighting can provide bright white light at a programmable output level. Using phosphorous filters, LEDs can provide a full spectrum of light at times of the day when natural light is waning. This helps people in training to push themselves a little further when they need it and provides an environment which is geared towards physical activity. 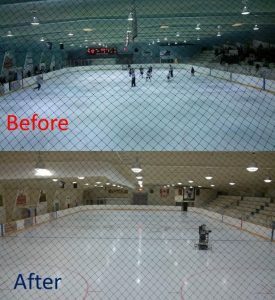 It is also true that LED lighting can changed to suit different areas of the sports center. For example, softer lighting can be used in changing rooms and cool down areas. Individual bulbs can be used for many purposes. This is not something which can be said for rival technologies such as metal halide bulbs, high pressure sodium lamps and other high intensity discharge lights. LED lighting will turn on immediately, can be used on programmed schedules and can emanate different types of light at different frequencies from the same fixture. HIDs cannot. Indoor Sport Courts: whether badminton, 5-a-side soccer or basketball courts, you can’t play in low-ceiling spaces. High bay LED lights fill up these large spaces without using vast amounts of energy. Administration areas: LED lights use wattage equivalent bulbs, but they use much less electricity compared to metal halides or similar. In office areas, lower wattage equivalent LED bulbs can be used with the same cost effectiveness as their industrial cousins. Car parks: parking garages and entrance ways can use low bay bulbs which are able to fill horizontal space in a similar way high bay LED lighting fills the vertical. Well-being areas: many gyms and sport centers now have areas which are used for well-being as well as general fitness. Whether these involve spa facilities or steam rooms, LED lighting can be manipulated and used to create the right atmosphere for customers. LED lighting lasts longer meaning you don’t have to replace them often. They do not suffer lumen depreciation like other bulbs. Energy efficiency is improved, especially as they do not waste energy on heat like HIDs. Direct replacement and retrofitting abilities allows LED lighting to save on fixtures and installation. There are many more benefits besides, but the bottom line is that LED lighting is better in both a generalized and specific sense. Check out our product information to find out how we can better help in your athletic environment.